I haven't any idea what kind of bird this is but have to believe it belongs to the duck or goose family. I like its distinctive appearance and coloring.There's quite a few of them at one of the local parks. Can anyone identify it? Looks best in X sizes. 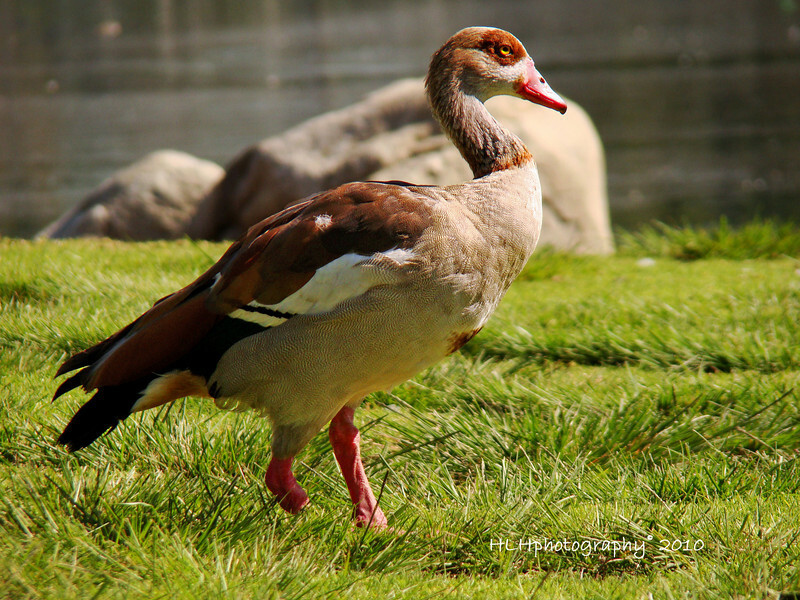 Tom Reichert ( http://thebarnman.smugmug.com/ ) identified this unusual bird as an Egyptian goose. Thanks, Tom! Now this one here is an Egyptian goose. Small numbers in California. Great find !!! Beautiful shot and detail...I checked some of my books,but i can't seem to find this one! No idea but certainly an interesting image. Howard was my grandfather's name. It's a great name. Great catch on this. Beautiful details. What an interesting looking fellow. I don't know. I really like the shot of him walking on his way in the sunlight.